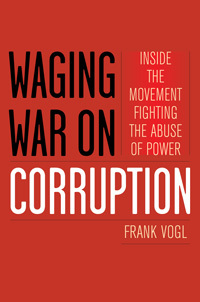 Frank Vogl, co-founder of both Transparency International and the Partnership for Transparency Fund has published Waging War on Corruption: Inside the Movement Fighting the Abuse of Power. At PTF we are honored to have the book dedicated to our organization along with Transparency International. From the birth of pioneering anti-corruption organization Transparency International in 1993, to the Arab Spring in 2011, this is the story of people who risk their lives (and the many who support them) to combat government-business conspiracies to secure justice, accountability, transparency and integrity. It is the story of an African child denied an education because her parents cannot bribe a school teacher, and of hundreds of thousands of Egyptians who overcame their fears, encouraged by Twitter and Facebook, to demand an end to government abuse. This is an insider’s account of the battles, the fighters, the villains and their victims. Now, as never before, from vast public rallies in India to “Occupy Wall Street” demonstrations, the fight against corruption is moving ahead. Major policy questions must still be resolved in the White House and far beyond – at stake is nothing less than our global security, the reduction of poverty, the stability of our economic and financial systems, and the cause of freedom and democracy. In Frank’s own words: The Arab Spring was the trigger that prompted me to finally start writing a book that I had long been thinking about – a book that aims to change the conversation about one of the gravest problems facing most countries: corruption in government. I have been involved in civil society organizations dedicated to fighting corruption for more than 20 years and seen remarkable progress in this period. The achievements have been formidable. It is time to convert discussion about the prospects of curbing graft and bribery from one of skepticism, indeed cynicism often, to one of cautious optimism and hope. View Frank’s presentation at the Institute for Corporate Social Responsibility’s event: Democracy, Security, Human Rights & Poverty – The Challenges of Global Corruption. Frank Vogl is a former international economics journalist (Reuters, and The Times, UK). He served as Director of Information & Public Affairs at the World Bank. Frank is President of Vogl Communications, Inc. in Washington DC – a financial and economics public relations firm. This new book is dedicated to two organizations: Transparency International (TI) and the Partnership for Transparency Fund (PTF). Frank is a co-founder of both of these organizations. He served as Vice Chairman of TI for its first 9 years, was a Board director for 12 years, and now serves on its Advisory Council and as the Advisor to the Managing Director. Frank is the Vice Chairman of PTF. Born in the UK and a graduate in politics from Leeds University, Frank Vogl is both a citizen of the UK and US. He has written extensively about economics, business ethics, governance and corruption. This is his third book. Click to visit Frank’s website or follow him on Twitter @frankvogl.